Australian Children’s Education and Care Quality Authority (ACECQA) Chief Executive Officer, Gabrielle Sinclair, reflects on the quality ratings of family day care services and looks beyond the headline figures. The family day care sector is in the spotlight regularly, but sadly often not for the right reasons. Family day care has been, and remains, a preferred and appropriate option for many Australian families. 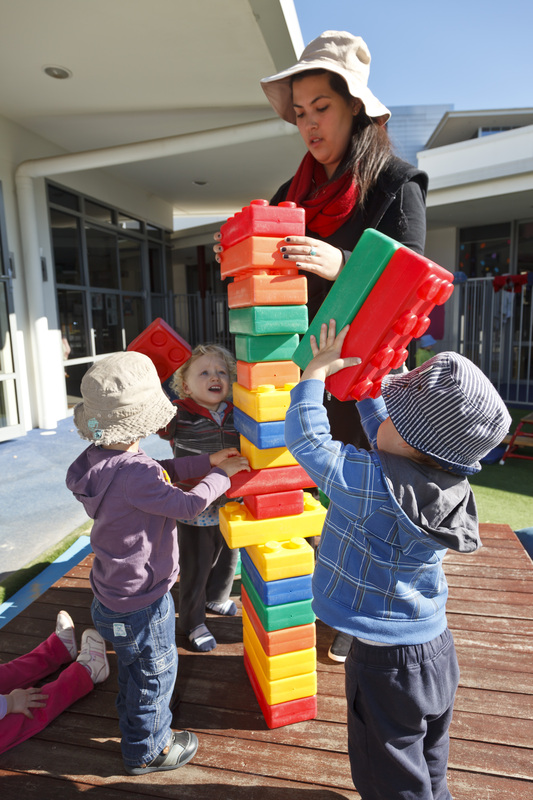 The latest Early Childhood Education and Care National Workforce Census, undertaken by the Australian Government, estimates there are more than 30,000 educators working in the family day care sector. Our most recent NQF Snapshot (Q3, 2017) shows that, as at 1 October 2017, 78% of approved family day care services have been quality rated, equating to some 664 individual services. Less than half (43%) of these are rated Meeting National Quality Standard (NQS) or above. It would be wrong not to acknowledge that, as a service type, family day care services need to improve their quality ratings. 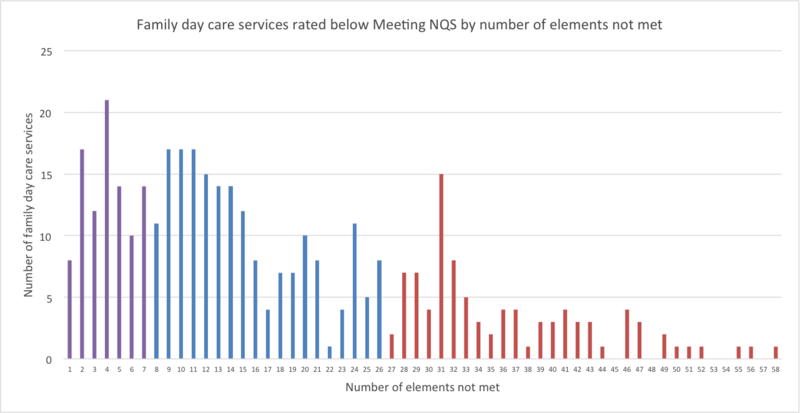 More than three quarters (76%) of centre-based care services are rated Meeting NQS or above, with a third (33%) of these rated Exceeding NQS or above. In contrast, only 16% of family day care services are rated Exceeding NQS or above. However, this is not the complete story. To take the headline figures and then conclude that all family day care services are poor quality is misleading for families. At the top end of performance, three family day care services have achieved an Excellent rating. To be eligible for this rating, a service must first be rated as Exceeding NQS and then demonstrate how they are promoting exceptional education and care that improves outcomes for children and families, and showing leadership and a commitment to sustained excellent practice through continuous improvement. One of the three Excellent rated family day care services, Wynnum Family Day Care in Queensland, received the rating for the second time late last year (the Excellent rating lasts for a period of three years), having been the first family day care service in Australia to receive the rating in 2013. There are then 106 family day care services rated Exceeding NQS and 175 rated Meeting NQS. To be rated Meeting NQS, a service needs to meet all of the quality areas, standards and elements of the NQS. This is a high bar and means that a service may be rated Working Towards NQS based on not meeting only one (or all 58) elements of the NQS. We want families and the general public to understand what Working Towards NQS means and to look below the overall rating so that they are well-informed about their choices. Almost 100 (96) family day care services rated Working Towards NQS do not meet seven or fewer elements of the NQS. At the other end of the spectrum, a similar number (94) of family day care services do not meet 27 or more elements of the NQS. By examining the element level performance of all services rated Working Towards NQS, families will have a much better idea of the range of quality and how close, or far away, individual services are from meeting all of the requirements. It is also the case that individual services can be rated Exceeding NQS for one or more of the seven quality areas without achieving an overall rating of Exceeding NQS. This could be because they do not receive enough ratings of Exceeding NQS across the seven quality areas or because their performance is below Meeting NQS in one or more of the quality areas. 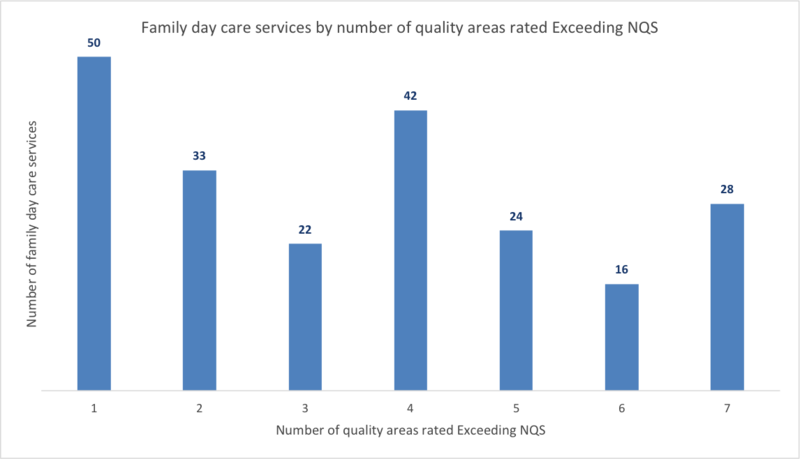 While only 109 family day care services are rated Exceeding NQS or above overall, a total of 215 services are rated Exceeding NQS for one or more of the quality areas, with 28 services rated Exceeding NQS for all seven quality areas. While the National Quality Framework is committed to shining a light on poor quality and taking swift action in response to fraudulent behaviour or practice that poses a significant risk to children, we should also ensure that the efforts of the majority of family day care providers and educators are not disregarded or diminished. 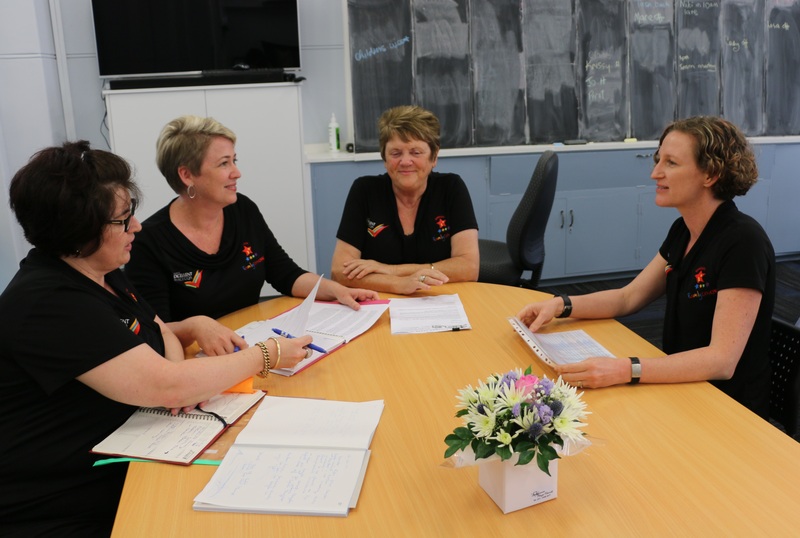 One of ACECQA’s roles is to promote and foster continuous quality improvement and to support parents and the community in understanding what quality means. It will always be important to provide a balanced and accurate portrayal of performance across all service types. One of the most important aspects of the quality rating system is that it provides freely available information to assist the decisions of parents and carers when considering which education and care service would best suit the needs of their children. I would encourage educators to help families to be aware of, and understand, their service’s quality rating and to explain how they are tracking on their journey of continuous quality improvement. This month Zora Marko, Road Safety Education Project Manager from Early Learning Association Australia, talks about their new Family Day Care Safe Transport Policy for family day care (FDC) educators and providers. Zora explains the importance of protecting children while travelling and provides helpful tips on best practice when transporting children. While this policy is targeted towards FDC educators and providers, Early Learning Association Australia also has a separate Safe Transport Policy for centre-based services. Car crashes are one of the leading causes of child death in Australia. Several thousand children aged birth to six years are hospitalised each year in Australia from injuries sustained in car crashes. And while studies by road safety researchers show that almost all young children in Australia (98 per cent) use child restraints when they travel in cars, about one quarter of children are using the wrong type of restraint for their age, and about 70 per cent of restraints are incorrectly installed or used. Wrongly installed or used child car seats have alarming consequences for children in a car crash. It is estimated 42 per cent of child deaths in car crashes and 55 per cent of injuries could be eliminated if all children aged one to six were travelling in an appropriate child car seat that was correctly installed, according to a recent study by Australian road safety researchers, published in the medical journal Pediatrics. Early Learning Association Australia (ELAA) worked with VicRoads, Family Day Care Australia and other peak bodies in the family day care sector, as well as leading early childhood experts, to develop the Safe Transport Policy (Family Day Care). 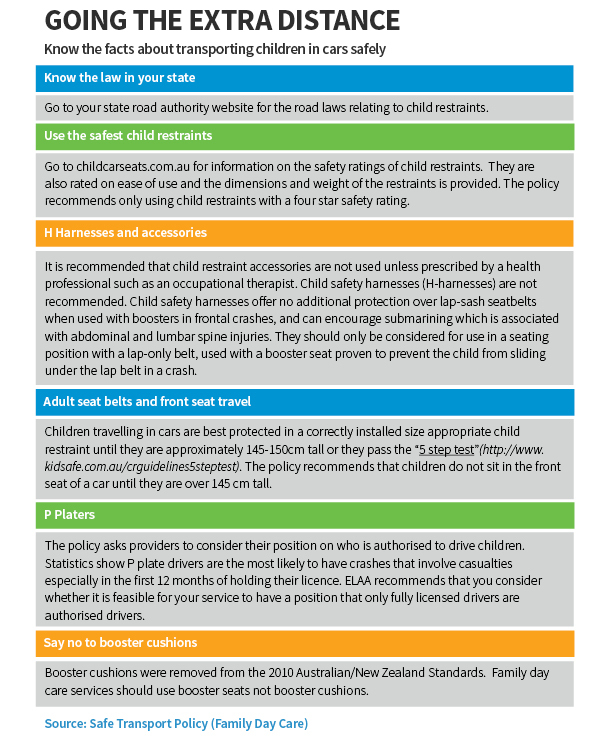 It is based on the Best Practice Guidelines for the Safe Transportation of Children in Vehicles published by Neuroscience Research Australia, an independent, not-for-profit research institute. The policy reflects best practice and goes beyond the minimum legal requirements outlined in Australian road laws. For example, it is legal to use a safety harness, also known as an H harness, for children travelling in cars in Victoria, however the policy recommends against their use. Research shows that safety harnesses provide no safety advantages over lap-sash seat belts and may, in fact, increase the risk of injury. While the law sets minimum standards for the safe transportation of children we still need to do the best we can to protect children and keep them safe while travelling, especially when we’ve got the scientific evidence and the knowledge about the sorts of best practices that should be implemented. ELAA understands that we’re aiming high with these best practices and recognises that it may take some time for family day care educators to take on all aspects of the policy. ELAA will provide support with education and resources to help the sector adopt the policy. 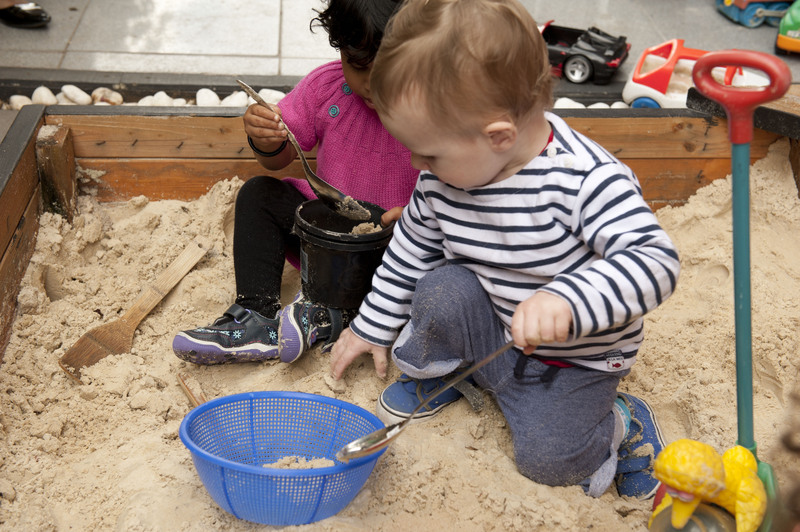 Moonee Valley City Council, a local government authority in Melbourne’s inner west, is trialling the best practice policy among its 11 family day care services. The council has held professional development sessions for educators and coordinators about the best practice policies. Gurpreet Thiara, the council’s Children Services Development Officer, said educators’ main concerns included how to determine the age and appropriateness of a car seat, especially when parents provide their own car seat. “Educators appreciated the information they received from the training session and they are now more confident, not only in transporting children in their care, but in answering questions from families about safe transportation,” Ms Thiara said. Shane Lucas, ELAA’s Chief Executive Officer, said the best practice policy, developed in partnership with VicRoads, was a great example of how diverse organisations could work together to create practical improvements for educators, children and families in early learning services. Wei Du, Caroline F. Finch, Andrew Hayen, Lynne Bilston, Julie Brown and Julie Hatfield (2010) ‘Pediatrics’, Relative benefits of population-level interventions targeting restraint-use in child care passengers, p304-312. This week is National Family Day Care Week. To recognise the work family day care educators and providers do for children across Australia, Family Day Care Australia has prepared this blog on their experience of the different ways family day care meets the needs of families, including a service that is helping children with autism. 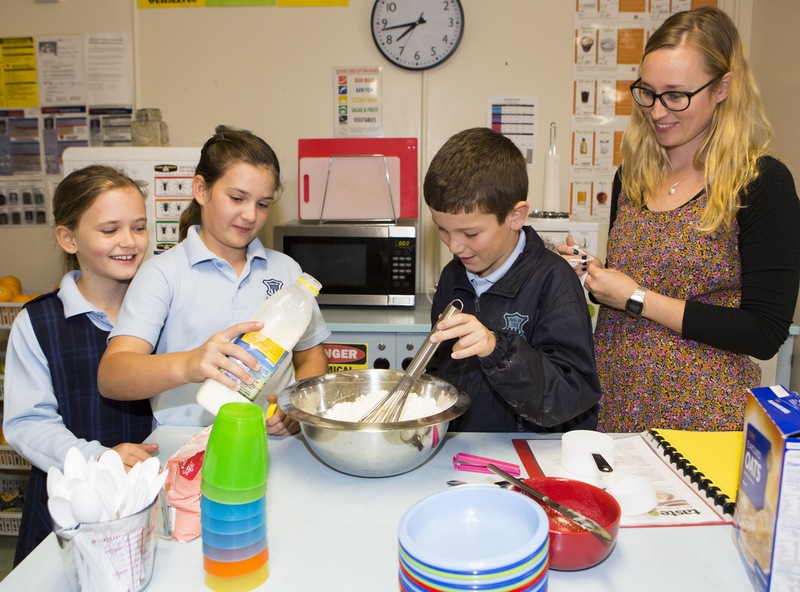 Family day care has always prided itself on offering unique learning environments and experiences, but the sector has come a long way since the initial pilot program was launched in Australia 43 years ago. Then, the much smaller sector was unregulated, and thought of as a cheaper and less formal form of child care run by ‘day care mums’ or ‘backyard babysitters’. Now, family day care has cemented itself as a high-quality form of early childhood education and care provided by qualified, professional educators. With more than 142,400 children enrolled across Australia, family day care now accounts for 13 per cent* of the entire early childhood sector. Numbers have jumped 15 per cent in 12 months, making family day care the fastest growing form of child care in the country. It is the very nature of family day care – being run by individual educators in their homes to the meet the needs of individual children – that contributes to this increasing popularity. 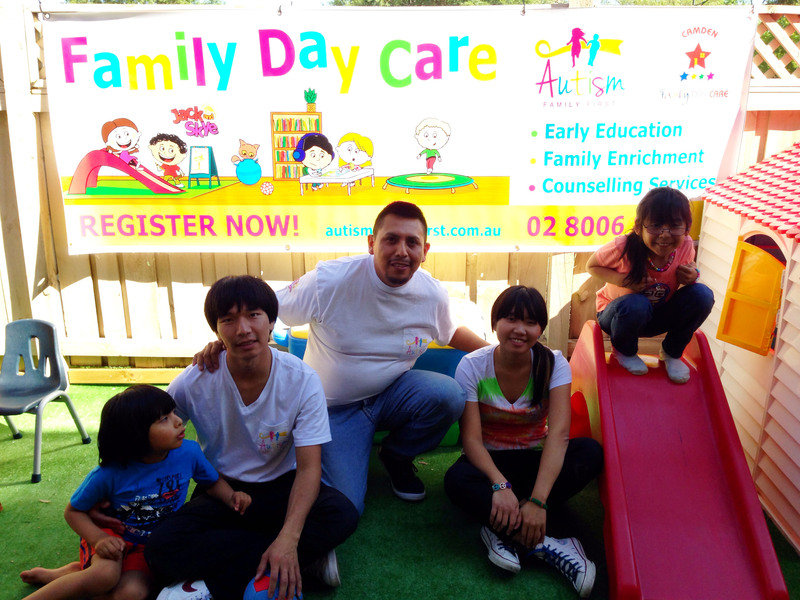 Family Day Care Australia’s Sector Support team has noticed a growing number of new, innovative services popping up – particularly specialising in the areas of multiculturalism and sustainability. Whether it is through Indigenous programs, remote locations or a holistic, back to nature approach, family day care services are offering a unique form of early childhood education and care. It is this personal touch that allows family day care services to meet the extremely diverse needs of modern Australian families. One ground-breaking example of a family day care service that is targeted to a specific need in the community opened last month in Harrington Park, Sydney. Registered with Camden Family Day Care, educator Dennys Martinez has developed a unique family day care service that is very close to his heart. Autism Family First Family Day Care is Australia’s first ever family day care service run specifically for children with autism. The idea was born out of the Martinez family’s own personal experience with autism as Dennys and his wife Maria’s two children, Maya, 7, and Eric, 5, were both diagnosed with the disorder. As a result, the family travelled to the United States to learn about different therapies to help with their children’s development and discovered the home-based, child-centred “Son-Rise” program, developed by parents for parents with a focus on sensory integration and relationship-based play. Dennys returned to Australia with a desire to empower other parents with skills and knowledge to support their children who have autism in the long term. “I ran some workshops but had lot of parents saying to me ‘I don’t know where to take my kids’ as there were only three autism specific early learning and care centres in NSW,” he said. Dennys said he discovered a real need for autism specific care and found family day care to be the ideal environment. “The numbers are small, it is in a familiar, home-based setting and the ages go up to 12. But the fact that it is about assisting children in their own way is what is most important because no one child is the same,” he said. There are structured activities such as martial arts, yoga, music and art, with help from volunteer therapists. Children and their families have a transition period to adjust to regularly attending family day care and Dennys has even developed a children’s book called ‘Jack & Skye Go to Family Day Care’ to help children with autism understand the process and reduce their anxiety. The service also offers a lot of support for families. The website has a forum for parents to login and share ideas, tips, events and different therapies or research. “The parents are all very grateful because I understand what they are going through and they can leave their child with me knowing it is a place they will be assisted and well cared for,” Dennys said. Dennys hopes other educators will be inspired to develop family day care services that are targeted to meet specific needs within the community. Find out more about National Family Day Care Week. (*Source: The Department of Education (formerly known as DEEWR) Child Care and Early Learning Summary March 2013).